How do you get ready for a trip to Antarctica to photograph 5,500-year-old moss or a journey to the Balearic Islands to shoot 100,000-year-old sea grass? Fine art photographer Rachel Sussman talks about traveling the world to photograph the oldest living things. Aimee Baldridge: For the past seven years, you’ve been traveling the world to photograph the oldest living things. What was the impetus for the project? Rachel Sussman: I was always really interested in making landscape work that deals with the relationship between humanity and nature, and has a fresh travel aspect. In 2004, I went to Japan, just to photograph, and ended up having an amazing travel adventure. I was with some friends in Tokyo, and they suggested I should go visit this 7,000-year-old tree, Jōmon Sugi. (It's not actually 7,000 years old; people are prone to exaggeration with these things.) So I went on a journey to find the tree on the island of Yakushima, in the southernmost part of Kyushu. On the ferry ride over there, I met some people who said, "Who are you? What are you doing? No Americans come here." By the time the ferry ride was over, I was invited to stay at a Japanese family’s home on the island. I went on a two-day hike with them to visit the tree. It was a transformative, wonderful experience. After that, it took about a year and a half for the idea of looking for the oldest living things to crystallize. I ended up with the goal of photographing things that are 2,000 years old and older, because I wanted to work back from the year zero. AB: What kinds of places have you traveled to for the project? Rachel Sussman: This thing has taken me literally to every continent. It ranged from Antarctica, which is incredibly difficult to get to, to places that you can just drive your car to. One of the things I photographed was the Senator tree in Florida, which was burnt down by a meth addict earlier this year. It was one of the oldest cypress trees in the world. I just drove to it with a friend who lives in the area, with her family in her minivan. On the other end of the spectrum, when I went to Antarctica, we were given a three to nine percent chance of being able to land on Elephant Island, even after getting all the way down there. Some of the things I photographed have UNESCO protection. I photographed a rare eucalyptus tree and was sworn to secrecy about its location. I could tell you what state it's in, but I can't tell you anything else. I hope that through doing this work, I’ve raised some awareness. I’d like everything that I photographed to be protected. We get a false sense of security that these things will continue to be around, but it's not based on reality. AB: How did you prepare for the trips? Rachel Sussman: The logistics took a really long time. Just getting things in order for these travels was really complex. When I went to Australia, I had six different things I was photographing in six different parts of the country. It sounds easy to say, "Oh, I went to Australia." But I spent over six months planning all the flights, coordinating with different biologists, trying to get the access I needed, making sure I had the right gear and enough film. Going to Antarctica took me two years to set up. I was talking to NASA and the British Antarctic Survey, and trying to get satellite maps of the moss I wanted to photograph. So I had a funny range of things to do to prepare, from checking if I had my pocket knife to remembering to write to NASA again. I did some sophisticated Google searching to find scientific papers written about the things I wanted to photograph, and then tracked down the scientists and researchers who are doing the work. Nine times out of ten, the scientists wanted to share their findings. Then there was a further hurdle in some cases of trying to get access. I was actually denied access to two organisms Tasmania. So sometimes I bumped into political issues. AB: How do you pack for a trip to a place like Antarctica or Greenland? Rachel Sussman: I try to not pack too heavy but also to be prepared. If you're out on the Greenland tundra, you can’t say, "I need an extra pair of gloves,” or “I need more food." Too bad. You have what you have. In Greenland I was carrying everything I had with me in backpacks for a couple weeks. I had my camping backpack on my back, and I had my camera backpack on my front. When I was in Antarctica, I was on a ship, so I could choose for the day what I was taking out with me, which made it easier. I have a lot of dry bags. You fold the top of them over and they become airtight and waterproof. A lot of times in Greenland and Antarctica, you’re out in a Zodiac boat, and you get salt water splashing in. So I actually have a dry bag that's big enough to fit an entire backpack inside. When I pack, I always have a system so that I can find things. My film is always in a particular place in lead-lined bags, which I use not just for airport security, but also to organize my film according to type and whether it has been exposed. Every container I bring is an organizational tool as well as holding something. Everything that I pack I try to have do at least double duty. I’ve had to figure out ways to really pack light while going on a month-long trip, especially when I was going to different climates on one trip. 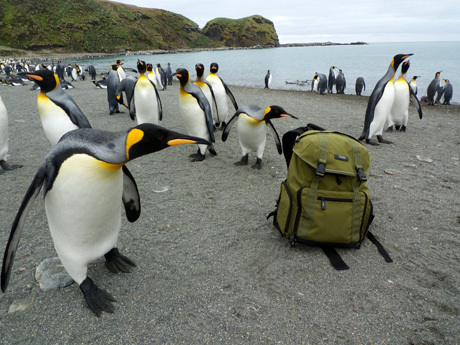 AB: Your photo backpack on the trip to Antarctica was a Tenba Messenger Photo/Laptop Daypack. What did you have in it? Rachel Sussman: I had my main camera, a Mamiya 7 II, and a Panasonic Lumix DMC-LX3. For the Mamiya, I had rolls of Fujifilm Fujicolor Pro 160S and 400H 220 film in lead-lined bags. I also had batteries, cable releases, a lens cloth, and a Sharpie. When I was traveling or hiking, and not just out for the day, I had my laptop too. I also carried a water bottle, nuts, and dried fruit when I was hiking. Rachel Sussman: I like a backpack that's flexible enough to deal with whatever environment I happen to be in. I definitely look for a good combination of big spaces and specific smaller places to put things—something with just the magic number of spaces, but not too many extra pockets where I could lose things. As I said, I have a system when I’m packing. I always prefer to have a backpack that I can secure a tripod to on the outside. There have been times when I couldn't fit my hiking boots in my suitcase or backpack, so I always carry camping straps. They're elastic straps that have a Velcro fastener. I like to hook my hiking boots onto my camera bag on the outside. AB: What kinds of clothing did you pack when you went to Antarctica and Greenland? Rachel Sussman: I definitely brought technical gear, things that wick away sweat and still let you breathe. That's something people don't always think about when they’re going into a cold environment. If you're doing a lot of physical exertion, and you get sweaty and then cool down, you can get really chilled very quickly. For the trip to Antarctica I got a lot of gear from Patagonia. They gave me a Patagonia Pro account, and their stuff was fantastic. I took a combination of wool clothing for under layers and waterproof layers on top of that. I'd wear a layer of long johns and expedition-weight socks, a pair of expedition pants, and then waterproof pants that you can zip on over whatever you're wearing. And then neoprene muck boots. You wear the pants over the boots so that nothing goes down into your shoes. Almost every time we got off the ship in Antarctica, it was a water landing. The last thing you want is to jump in the water, and then go walking in the snow and have wet feet. So it was really important to stay dry. I have a waterproof jacket and a parka with a couple of different layers. You pretty much always want your head covered, but if you're hiking and exerting yourself you don't want a heavy wool hat on. So I had a little liner, a baseball cap, and then a hat that covered my ears. And gloves. It was often very, very cold on the water. Once I was shooting on the deck of the ship without gloves, and I lost feeling in one of my hands. It took probably half an hour to get my circulation back. I also brought lots of sunscreen. In Antarctica it's cold, but you're on the water and it's really bright. AB: What skills did you have to learn before you traveled to remote places? Rachel Sussman: I had to learn how to scuba dive to photograph brain coral in Tobago and sea grass in the Balearic Islands, in Spain. If I hadn't already done as much hiking and camping, I probably would have wanted to get some experience or training in that beforehand. I was a Girl Scout when I was little, so I know how to camp. I'm sure I've earned a lot of merit badges by now. AB: Did anything unexpected happen on your trips? Rachel Sussman: When I was in Tobago scuba diving, I got stung by fire coral. My face swelled up, and there was a big, angry looking welt on my leg. Coral can actually stay living in your skin for months. It's some sort of evolutionary tactic. I also broke my wrist in Sri Lanka. I was traveling on my own, pretty far out in the country. I slipped and fell, and I was taken to an open-air hospital with dogs and chickens walking around. I ended up leaving there with a piece of gauze and cardboard around my wrist, and driving back to the hospital in Colombo. They put me under, and then I flew back to the States. I was supposed to photograph a Banyan fig tree, but I never even laid eyes on it. AB: Do you do anything to prepare physically for trips that involve hiking and carrying a lot of gear? Rachel Sussman: No, but I try to exercise on a regular basis anyway. I grew up doing sports. I was a gymnast, and I used to perform trapeze. I’ve always been a “do what you’ve got to do” kind of person. With so much of the work that I do, if I don't bring it or I don't do it, nobody else is going to do it for me. I don't have the luxury of having an assistant. Sometimes that means I'm extra tired, and I definitely have to push myself. It’s also meant that I had to make a choice to buy a lighter backpack and a lighter tripod. Those things become really important when you multiply them over the course of many trips and hiking. One reason I always carry backpacks is for the more even weight distribution and the belts that help to distribute weight more evenly. So many people carry things with one shoulder. You get lopsided when you do that, and your body starts compensating in a negative way, and then all of a sudden your spine is twisting in the wrong direction. I’ve learned to do whatever I can to stay balanced, which is a good lesson for all areas of life. Rachel Sussman is a fine art photographer based in New York.